The Friends support the work of the Record Office and the Museum & Art Gallery in Berwick and their related interests across North Northumberland, from Beadnell to Wooler, from Belford to Norham. We promote lectures, exhibitions and special projects, arrange volunteer activities, and publish a quarterly newsletter. The pictures above show some historic places and activities in North Northumberland: Marygate in Berwick 1924; Berwick station early 20th century; Black Bull at Etal; Spowarts’ buses; the smithy at Ford; Norham around 1903; horse & plough near Berwick, 1950s; Tweeddale Press fleet of vans 1960s; Holy Island Causeway and Bamburgh Castle; herring girls at Spittal; Berwick shipyard 1979; the Border Chief ferry leaving Spittal; Tweedmouth goods yard; Deltic locomotive at Tweedmouth station; Golden Square shortly after 1928; salmon fishing at Outwater Stell; gypsies at Wooler Haugh; West Street in Belford. [Photographs: Berwick Record Office; Kevin Graham; Fred Kennington; Richard Ormston]. The collections of the Museum and Record Office illuminate these and many others. Discover more on other pages. The publications of the Friends include a quarterly Newsletter and a volume of local photographs. An online archive of the Newsletters extends back to 1994. Jimmy Strength is one of the colourful figures featured in the Window On Berwick exhibition which illustrates the history and culture of the area. 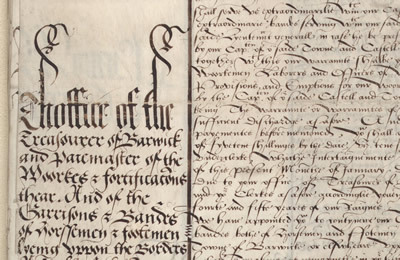 Tudor documents relating to the construction of the Elizabethan fortifications in Berwick were purchased with the assistance of funding from the Friends.